When determining the strength of a business, most executives look for the bottom line. Most want to make sure the business is bringing in customers and a profit, and they typically look at that bottom line purely in terms of numbers: what expenses can be cut or minimized? But not every executive considers relationships with employees as an effective way to improve it. Jeff Evans, president and CEO of Cross Keys Village–The Brethren Home Community, a senior-living community and nonprofit community-care retirement community located in New Oxford, Pennsylvania, insists that his employees remain at the heart of his proven formula for success. The great care provided at the staff level shows. When Evans interviewed for the CEO position, Cross Keys Village was having trouble keeping its occupancy levels up in a post-recession market. Today, it’s at full occupancy and growing. Evans credits this to a company culture of service, which starts at the top, goes down through the staff, and reaches all the way to the residents. Evans, his team, and the Cross Keys Village board all recognize that it’s not the managers who deserve all the accolades—it’s the frontline staff, those “out in the trenches” doing the hard work, especially in nursing. Likewise, the company is careful to hire managers who will make for great fits in this type of culture. Cross Keys Village also provides ongoing leadership training for all managers to make sure the servant-leader approach is instilled across the organization. Evans stands at the construction site of the new, state-of-the-art, thirty-two-bed memory-care residence. Cross Keys Village is combining the latest body of knowledge in the field of memory support with an inviting bed-and-breakfast philosophy to create an environment that is both functional and comfortable. Evans has proven his tenacity by doing what Cross Keys Village hired him to do: improve occupancy levels. He accomplishes this not by only introducing his management style to the senior living community, but also by creating a campus master plan to take the company into the future. That master plan has three parts, and the company currently has $32 million invested in building projects to make it happen. The first part of the master plan is a brand new specialized memory-care residence for thirty-two people. It’s a need that Cross Keys Village identified within its broader community, so it set out to become the regional leader in memory support services. It will be a leap forward in the existing memory-care program and will help give the company a competitive advantage in the market. 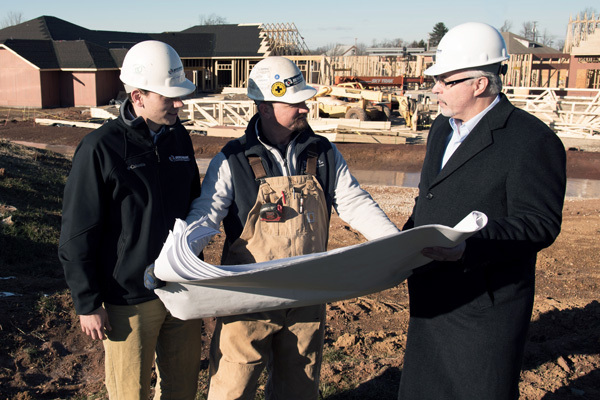 Cross Keys Village started with programs to engage the broader community in supporting people outside the walls of the senior living facility, but now, the new memory-care residence is under construction and is scheduled to open later this year. It’s a strategic new direction for the company, and it has already earned Cross Keys Village significant attention. The other two parts of the campus master plan include the construction of fifty-one new homes in the residential living area over a three-year period and an expansion of the casual-dining café that will double its size and increase the services offered. “We’re taking some cues from what you see in Starbucks and Panera Bread, where these are active destination places you can go throughout the day,” Evans says. “That’s where people want to go; that’s where they want to hang out.